Minnesota will be on the eastern edge of what is predicted to be a significant winter finch movement this year, birds coming south out of northern Canada. They will be searching for seeds. The irruption is predicted by Ron Pittaway of Toronto. He annually collects information from numerous Canadian sources to measure probable finch movement. Pine Grosbeaks will move south in moderate numbers. Best bet will be farther north than Twin Cities. Purple Finches are on the move already. They will be looking for black oil sunflower seeds, the preferred seed for most North American finch species. They could arrive at your feeders. Crossbills — red and white-winged — will be scarce, most of them, he says, moving west into mountain habitat or east to Newfoundland. Seed crops are good in both areas. Common Redpolls also are to be expected at Minnesota feeders. They favor niger thistle seeds. 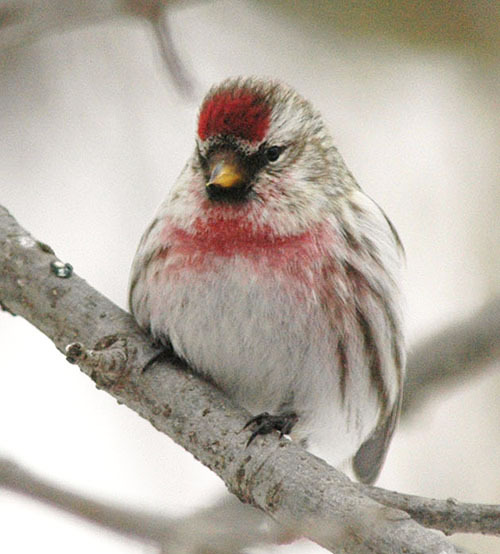 Watch for Hoary Redpolls in the visiting flocks. Pine Siskins, too, are already moving south, Pittaway says. They like the niger seeds. Evening Grosbeaks could appear on moderate numbers. This is a species usually seen in northern Minnesota if at all. Explaining the movement, Pittaway says this is not a good year in central and eastern Canada for spruce, birch, and mountain ash seed crops. Also look for flights of Blue Jays and Red-breasted Nuthatches. The jays like acorns, so they will be coming to the right place, given our bumper crops. 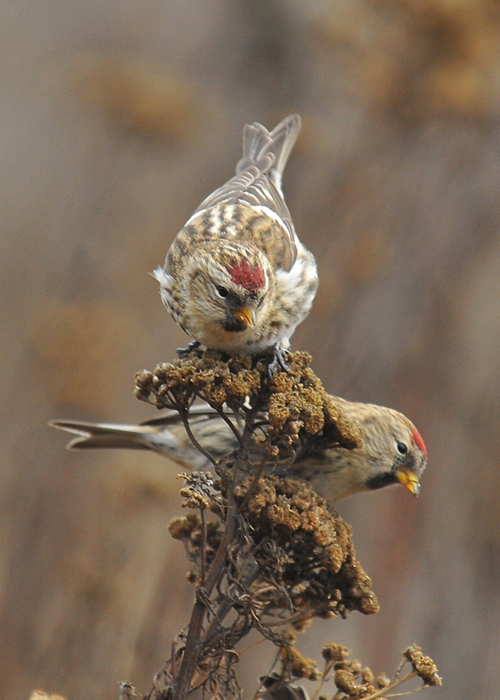 Redpolls also can be found feeding on weed and flower seed heads.